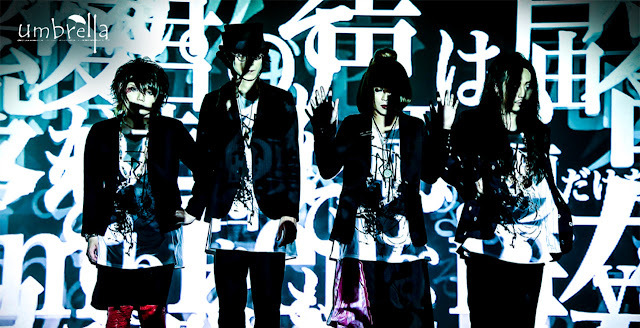 umbrella - "Yoru no Curtain" member's comments + event schedule | VKH Press – J-Rock & Visual Kei Coverage Worldwide! We posted earlier about umbrella's 4th single Yoru no Curtain set to release on November 2nd. Additionally, they have announced a one-man live titled “Chapter.3 [Taion]” that will take place at OSAKA MUSE on December 16th. Tickets will be available via eplus starting October 1st. Advance tickets will be 3500 yen, while at-door price is set at 4000 yen, not including drink fee. Additionally, a free tour documentary DVD will be given to all concert goers. The title track “Yoru no Curtain” is, a song depicting the feelings of two different people between dreams and reality, a dramatic song until the end. Also, regarding the coupling songs, “Labo” is a loud song that will take on the challenge of breaking the shell of umbrella’s sound as it has been until now, and “Red Signal Day (re-recorded)” is a recorded version of “Red Signal Day” that was originally released in 2013 as a live-venue-limited release. In addition to a solid performance, it’s an umbrella that appeals to listeners’ feelings with its world of snuggly lyrics. Comments from the members can be found below. I’d been saying that I really really want to release a single really soon. I hope that it will become a nice encounter for everyone. And so we’re going to conclude 2016 with a one-man at OSAKA MUSE. A new release was decided. I’m happy to think that taking on the challenge of new songs will continue updating umbrella’s history every time. After meeting lots of different people and encountering various kinds of music at events from day-to-day, which is what we do as umbrella, I’m really looking forward to what we produce now because it’s as umbrella’s guitarist that I am able to output new sounds for releases. CD’s releases are fun! One-man lives are also fun! And, producing sound itself is very fun! In addition, it’s also fun for listeners of the CD to join in with the live audience. What we’re working towards is for this to be more fun and not restricted to one manner. Something that I really believe, is that anything is fun when everyone is happy. A new single Yoru no Curtain will be released. It’s a song with an airy feeling which only umbrella can create, somewhere it has a personally nostalgic impression. To go with the release, it’s been decided to have a one-man live at OSAKA MUSE, where we haven’t played in about 2 years (maybe? ).